With the end of the year quickly approaching we are continuing our 2013 in Review series. Last week we announced the top viewed blog posts of the year as well as the most visited author profiles of 2013. Today, we are excited to announce the Top 5 most viewed vizzes of the year, of which the top two have each accrued more than a million visits! If you're interested in seeing how many views your own vizzes have had you can add the page counter to the footer when sharing URL links and embed codes. Simply add ? :display_count=yes to viz URL’s or change the param name='display_count' value='no' to “yes” in embed codes. You’ll then be able to see the total tally of visits since that viz was first uploaded to Tableau Public. If you re-save your viz with a different name, the counter will start anew – so make sure to overwrite the same viz whenever you make slight changes. 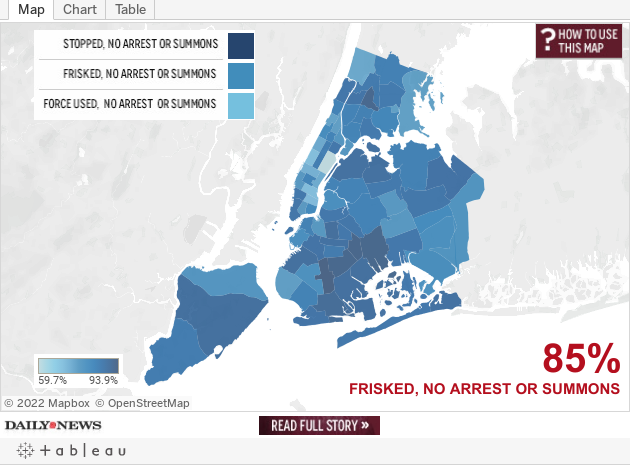 The single most viewed viz of 2013 comes from the front page of the New York Daily News, created by Sarah Ryley to show the breakdown of stop and frisk events in New York City. Make sure to check out the other tabs in the workbook for more charts. Congratulations to Sarah and her team on an outstanding viz! The second most viewed viz of the year comes from Argentina and the award winning La Nacion Data authors. 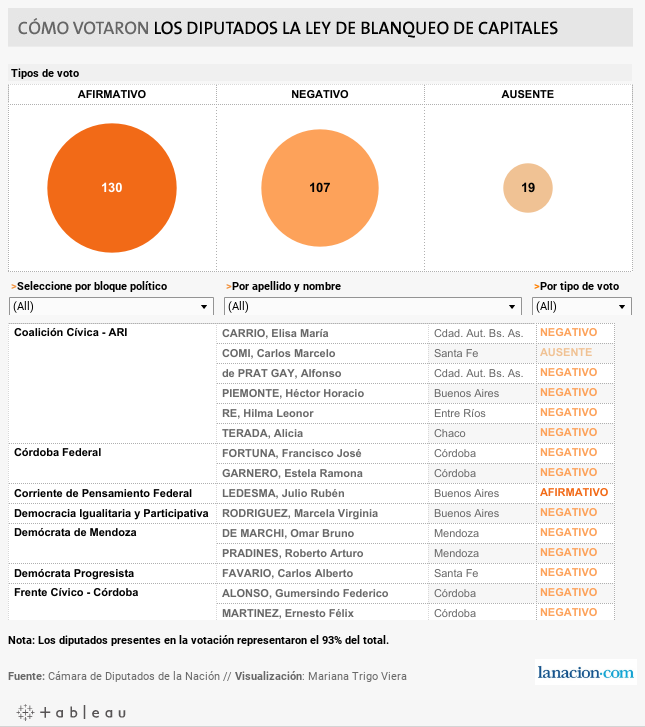 It shows how each House of Representatives member voted for Argentina’s “currency bleaching” law which passed in May. For more information you can see the English translated article here. The third most viewed viz comes from John Burn Murdoch and The Guardian Datablog, it’s no longer embedded on the story page but can be viewed below. The classic “bump chart” shows the reputation rankings of the top 25 universities worldwide based on the annual Times Higher Education Report. The fourth most viewed viz had been embedded in dozens of stories on another Argentine news site Infobae.com. 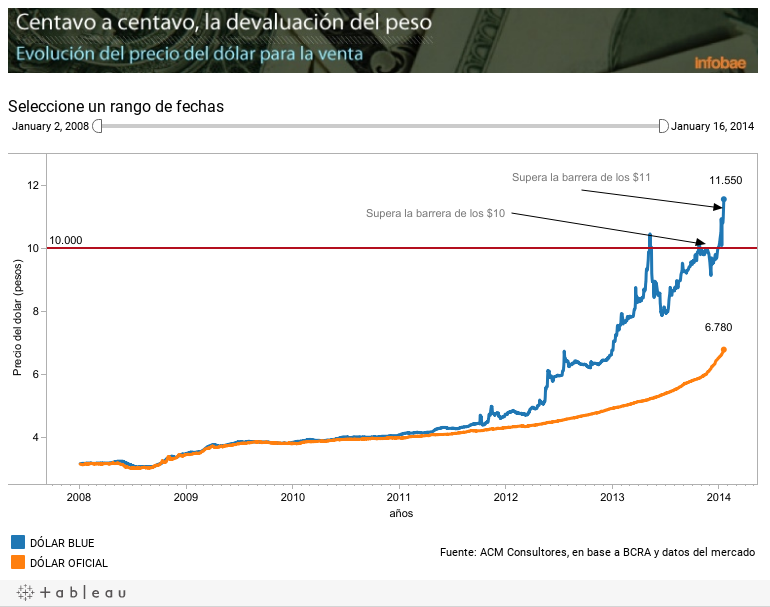 It shows the discrepancy between the officially reported and black market exchange rate of the U.S dollar in Argentine pesos. At this time the visualization is continually updated and between all versions has more than 600,000 views. 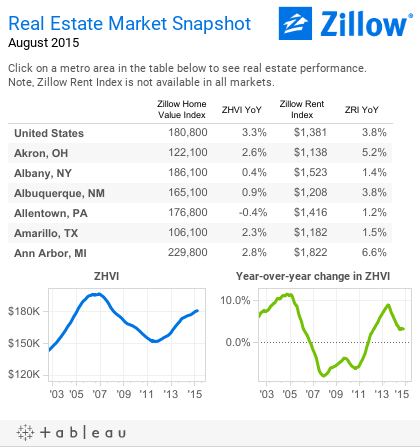 The fifth and final viz in this ranking come from our authors at Zillow. This real estate viz shows a decade worth of home values for different U.S. metro areas and is updated monthly. We look forward to seeing the stories you'll tell and the vizzes you'll build in the upcoming year. Our goal, as always is to help support and promote your work, make sure to share your vizzes with us directly by tweeting us @tableau, sharing on Facebook or at tableaupublic@tableausoftware.com.